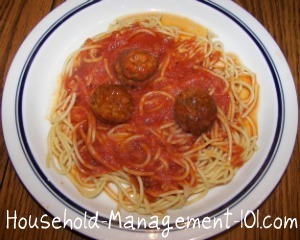 Here is a simple spaghetti and meatballs recipe that my family loves. 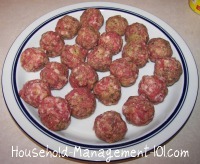 The beauty of the recipe below is that the meatballs are great in either a homemade or a store bought sauce, so you can choose which one to use depending on how much time you have to make dinner. I recommend using this homemade spaghetti sauce recipe whenever you can, because it is just so good. In fact, that is the type of sauce pictured. However, I get that there are hectic days where simmering a sauce for a couple hours just isn't going to work out. Then, just use store bought sauce and it will still taste awesome. Therefore, below my focus in on the meatball recipe for spaghetti. Combine all the ingredients, except the olive oil, into a large bowl and use your hands to mix everything together. Then, make into about 23-24 small uniform sized balls, like pictured to the left. 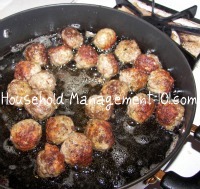 If you need more meatballs than this you can double this recipe easily, but know you will need to do the next step, which is browning the meatballs, in two batches. Next, heat your olive oil in a large pan. I suggest using a pan that you can later cover, and that is large enough to brown all your meatballs and also hold your sauce to simmer the meatballs in. If you are going to be eating soon after making this spaghetti and meatballs recipe make sure you use a meat thermometer to make sure the meatballs get completely done, which is 160°-170° F.
If you will be simmering the meatballs for a while in sauce this step is not as crucial, because the meatballs will cook completely as they simmer in the sauce. We like to simmer the meatballs in our homemade spaghetti sauce for at least two hours, to infuse the flavors into the sauce and meatballs. This is one of the recipes my family considers one of the best recipes ever! In fact, we love it so much, we have even made another recipe we all love, using the leftover meatballs the next day for this meatball sub recipe.